Item # 302064 Stash Points: 21,499 (?) This is the number of points you get in The Zumiez Stash for purchasing this item. Stash points are redeemable for exclusive rewards only available to Zumiez Stash members. To redeem your points check out the rewards catalog on thestash.zumiez.com. 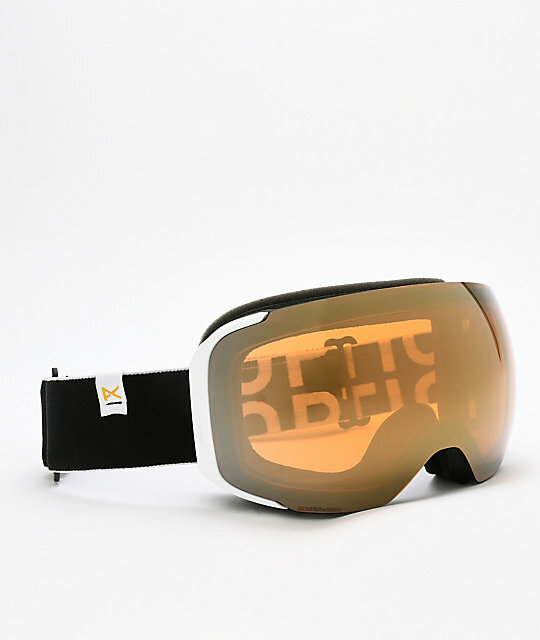 Shred the mountains in confidence and clarity with the M2 MFI JT Sonar Bronze & Infrared Snowboard Goggles from Anon. Coming to you with two easy to change lens options from Ziess; the SONAR Bronze lens for bright, sunny days, along with the Blue Infrared lens for low-light, cloudy days. 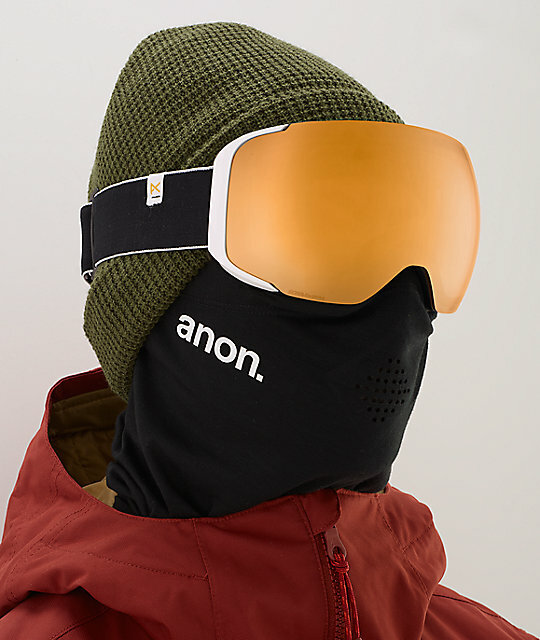 Anon's groundbreaking MFI® magnetic facemask is included, which easily attaches to your goggle via four magnetic connection points for seamless facemask integration. 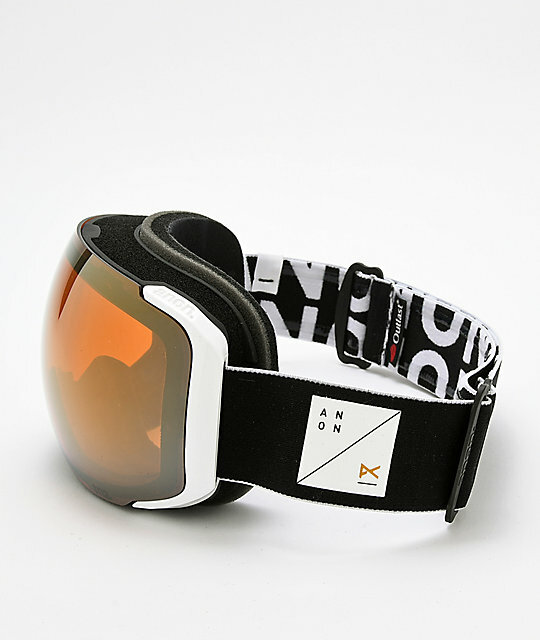 Full perimeter channel venting and Anon's ICT anti-fog treatment delivers fog-free, crystal clear vision, so you can tear up the mountain without compromising quality. 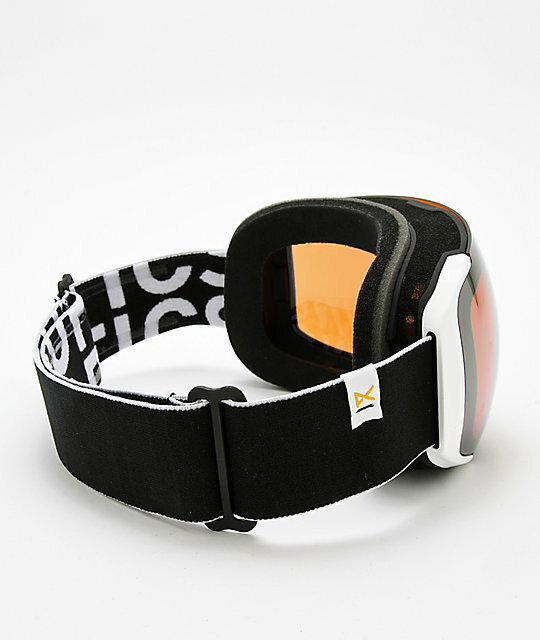 M2 MFI JT Sonar Bronze & Infrared Snowboard Goggles from Anon. White frame with black logo strap. Frame Height: 96mm / Size: Medium men's specific fit & design. SONAR Bronze by ZEISS: Bronze base tint with gold mirror coating reduces glare and offers a Visual Light Transmission (VLT) of 19% making this lens ideal for bright lighting including partly cloudy to bluebird conditions. Spare lens included: SONAR Infrared tinted lens with 57% VLT for partly cloudy, flat lighting and dark cloud coverage. MFI® (magnetic facemask integration) facemask included. Attaches via 4 magnetic connection points. Triple layered multi-density foam backed with moisture-wicking fleece is comfortable on the face, breathable and fast-drying.